It's basically Cinnamon Toast Crunch (also General Mills) for grown-ups. This is an unusual cereal from the Total product line in that it doesn't have Total flakes. The cereal pieces actually resemble the square pieces from Cinnamon Toast Crunch. The taste is also very, very similar to Cinnamon Toast Crunch with some minor drawbacks. After you're hit with the initial cinnamon-sugary flavor you expect from the kid's cereal, you get a real sense of the whole grains that are used to make the cereal pieces. Granted, everything here tastes pretty good... it's just that the sugary kid-friendly aspect of the cereal doesn't completely jive with whole-grain adult aspect. Your mouth is aware that it's being feed a healthy cereal disguised as being more fun that it really is. Imagine a very serious old man in a clown costume. Somehow, you just sense that the guy isn't the fun-loving goofball you expect from clowns. On the plus side... this cereal is definitely more crunchy than Cinnamon Toast Crunch and it's nutritional profile is quite a bit better. This cereal has 4 grams of dietary fiber, compared to the other cereal's 1 gram. This cereal has 1 less gram of sugar and 1 less gram of total fat. The most striking difference is in the vitamins and minerals section. While Cinnamon Toast Crunch has only a 10% or 25% smattering of some vitamins and minerals, the Total box is showing 100% for most nutrients listed. With 100% and 25% of your daily recommended intake of Calcium and Vitamin D (respectively), the front of the box claims that Total Cinnamon Crunch has "the most Calcium and Vitamin D of any leading cereal". Overall, I liked this cereal, but not as much as it's predecessors. With Cinnamon Toast Crunch (and it's Malt-O-Meal rip-off Cinnamon Toasters), you finish a small bowl and say, "I'd like a little more". With this cereal, you finish a serving and say, "Okay, cool... I'm done." 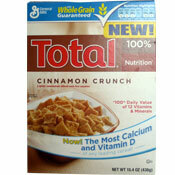 What do you think of Total Cinnamon Crunch? Total Cinnamon Crunch should be resurrected - it was a super breakfast cereal, a great snack for kids and a good base for a cocktail snack mix for adults. PLEASE bring it back! I love this cereal. It tastes great. I pour in the milk and let it sit. The cereal gets soft and it still taste great. Reason I let the cereal sit is because I have TMJ. I can't find it at Giant in York PA anymore. W. A.
I tried this cereal and thought it was way to sweet. I emailed the company with my opinion and suggested they reduce the sweetness and market it a new healthier reduced sugar Total cinnamon crunch. Also they could get rid of the artifical sweetners, if they want to be healthy. The artifical sweetners could account for the bad taste. I like the fact that this cereal tastes so good and has a good nutritional profile with all the vitamins. However, it does have a lot of sugar compared to the amount of fiber it has. I would go with the Kellogs Fiber Plus cinnamon oat crunch instead. This is a great way for me to snack and get the calcium among other vitamins that I need. Before that I took Flintstones vitamins everyday, but I wanted calcium without having to drink milk and this vitamin didn't have any. I hate the taste of cow milk and never consume it unless it is an ingredient in some recipe. Unfortunately this means that my calcium intake was no where close to the daily requirement until this wonderful masterpiece of a cereal. I agree with others that say it could do without the artificial sweetener, but that's not going to stop me from enjoying a cup of this every morning as a vitamin routine after coffee. I love this cereal! I'm always on the look-out for healthier substitutes of "guilty pleasure" foods- and this definitely works as a replacement for Cinnamon Toast Crunch. I changed my diet drastically over the past few years, so I got rid of my Cinnamon Toast Crunch a long time ago. Recently though, I purchased a mini variety pack of General Mills cereals for the portion control. My old favorite CTC was in there, but the portion (which is the amount one SHOULD be eating) did not satisfy me. I decided to seek out a cereal that would taste like CTC but would be healthier and more satisfying. Total Cinnamon Crunch is it, people! I'm going to try Cascadian Farm Cinnamon Crunch next (despite Mr. Breakfast's foreboding review on it), just to see what it tastes like. Although, I can't imagine something tasting better than Total! I think this stuff is delicious! It tastes like cinnamon toast crunch but not as overwhelmingly sweet, and has more nutrients. I never notice the aftertaste, I guess I'm weird or maybe more used to the taste of artificial sweeteners. I try to avoid anything with manmade sweeteners like the plague. Sugar is bad enough, let alone something guys in white coats have tinkered with. I was really upset to find I'd ingested Sucralose after buying this last night, thinking it was all whole grains, sugar, fiber and cinnamon. Sucralose is the last ingredient in the list. It says nothing on the front to indicate it has artificial sweeteners in it. I'm really not happy that they can put artificial sweeteners into a cereal like this and not label it more clearly. People comment on the after taste and it's the Sucralose (i.e. Splenda) that does that. I get migraines from this and other artificial sweeteners that they hide in "healthy" food. Finally a cereal that has high fiber, low sugar and all the nutrients at 100%, if I am going to spend $3.50, I will buy Total instead of a cereal with nothing in it! I am an adult that does not want to be overwhelmed with sugary cereals, hence why I tried this. I knew upfront this would not have the overload of sugar like Cinnamon Toast Crunch (read the label) and I found it to be a decent cereal. Does not get soggy right away, has just enough cinnamony-sweetness to it. I never noticed an after taste, maybe my taste buds are not as sensitive? I found it to keep me full longer with and I like that added nutrition in it. Its a winner in my book, not my favorite but certainly will buy again. The box should come with a warning label reading, "Caution: very strong aluminum foil aftertaste that lingers for hours." This is the perfect way to get a sweet sugary cereal fix without feeling guilty about it! Sure, it's not exactly as good as Cinnamon Toast Crunch, but for all the extra nutrition packed into this cereal I would gladly choose total! I tried this when my store was out of my usual Frosted Mini-Wheats and I haven't gone back. It tastes just like Cinnamon Toast Crunch, yet it's pretty good for you. I especially appreciate all the calcium. I've always wanted to start a "Total" habit but couldn't stomach the dry, bland flakes morning after morning. Now, I can finally please my sweet tooth while getting 100% of vitamins ABCDEFG! I have to agree it has a horrible after taste similar to Fiber One's caramel cereal. Yuck, waste of my 2.99 even if it was on sale - I will stick with my cheerios!!!! I was pleasantly surprised. I like total raisin bran... for about the 45 seconds before it becomes soggy. This has similar nutrition with a much crunchier and quite delicious taste. It's like a crunchier version of "cinnamon toast crunch" without sugar crystals. It DOES have a horrible aftertaste. It's the sucralose. Artifical sweeteners have their place (I suppose), but GM should label the cereal as "lite" or "diet" to prevent shopper surprise. Almost all other products with artifical sweeteners note their inclusion somewhere on the packaging in addition to the product list. I think this cereal has a HORRIFIC aftertaste. 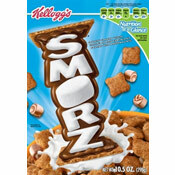 I was looking for something to try to replace my beloved Kellogg's Cinnakrunchers cereal that went to Cereal Heaven sadly a few years back. I agree there are lots of good vitamins in here, but the bizarre aftertaste that lingered for me will not make me a repeat customer of this stuff. Yuck!! I am on a diet, and this cereal packs everything I need in a great taste with low calories, low sugar, and high vitamin and mineral contact! It's a winner!